Uttarakhand Public Service Commission UKPSC has released the direction notification for PCS main Exam 2016. Candidates who have cleared the Uttarakhand PCS Pre Exam 2016 . Now they can apply for main exam through official website of UKPSC ukpsc.gov.in . First visit Official website of UKPSC. 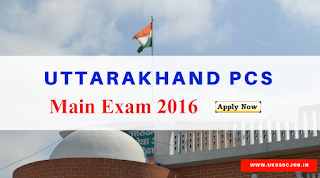 Now Search Uttarkhand PCS Main Exam 2016 Online Link. Fill your Correct Detail and print your application form for Future references. Uttarakhand PCS main Exam 2016 will be conducted by UKPSC in Haridwar and Haldwani .